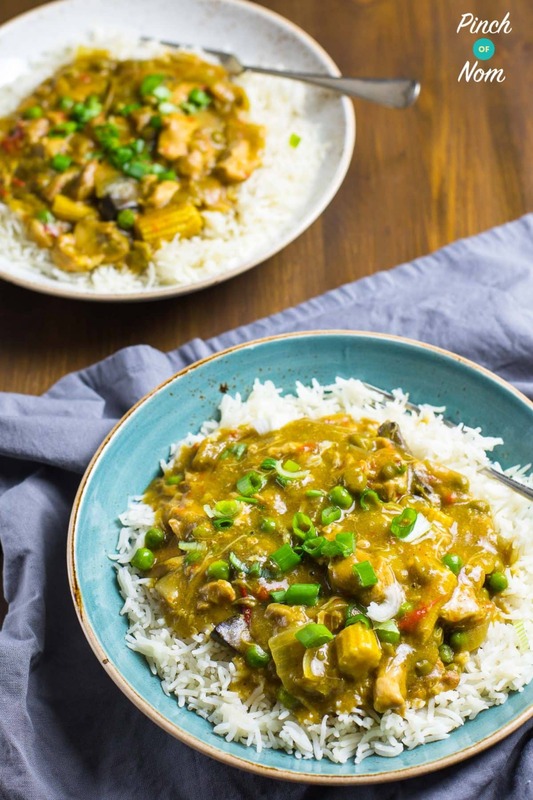 If you’re looking for a Low Syn, Low Point, Low Calorie Chinese Chicken Curry that tastes like the real deal, then this is the ideal recipe for you! 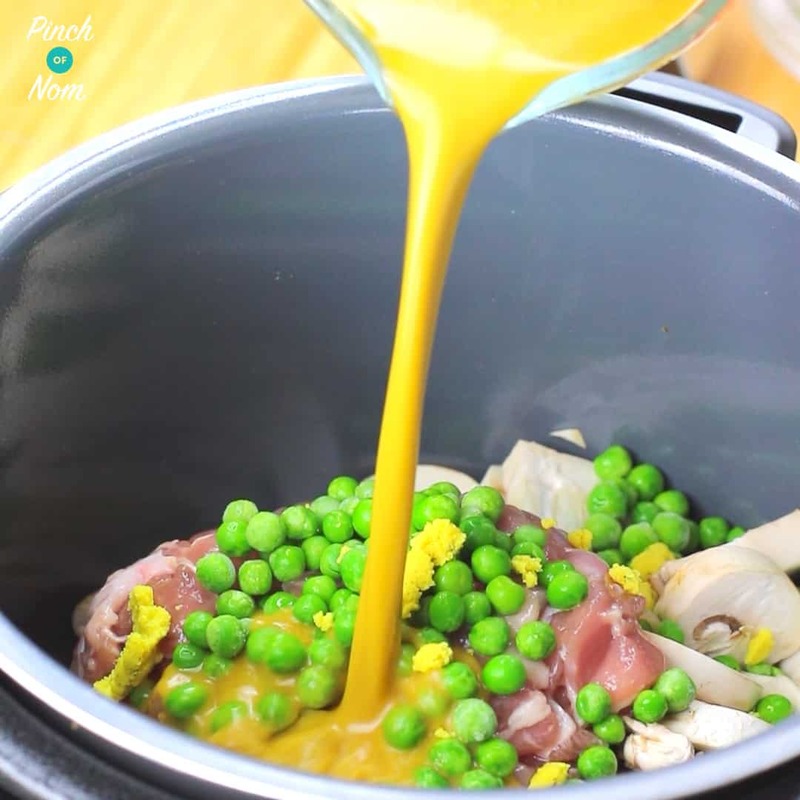 We often get asked over on our Facebook group what people can make with the Mayflower Chinese Curry Sauce, so we came up with this Slimming World, Weight Watchers and Calorie Counting friendly, Chinese Chicken Curry in the slow cooker! 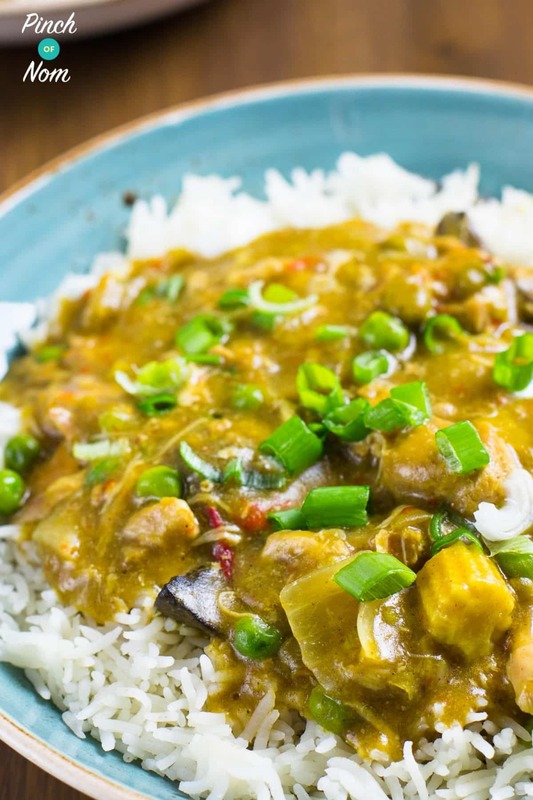 This Chinese Chicken Curry recipe is ridiculously easy. Seriously – it’s 4 steps long & that’s it. What’s more is that you just pop it all in the slow cooker! You can use what ever meat you like, we used diced chicken thighs as thighs are cheaper than fillets and we think they have loads more flavour! You could use pork, chicken, beef, or even leave the meat out and just add lots and lots of veggies. We used mushrooms, frozen peppers, baby corn and onions. Feel free to omit/add more or less of any of these – anything goes! 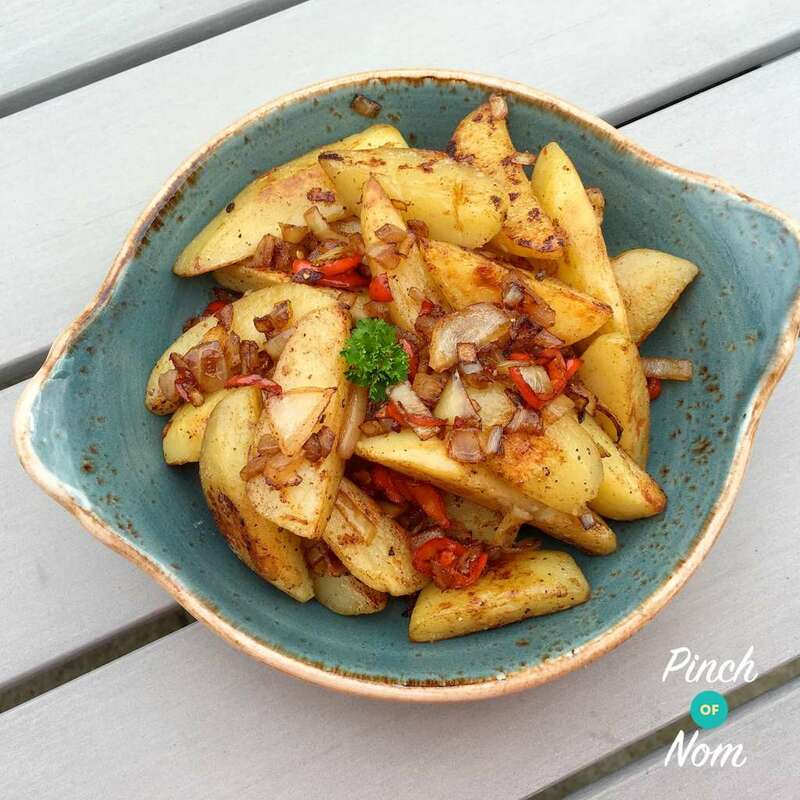 Serve on a bed of rice, or perhaps over some chips or wedges or even Syn Free Salt & Pepper Chips? We love our Chinese Chicken Curry with half chips, half rice and a load of stir fried veg on the side! How many Syns are in this Low Syn Chinese Chicken Curry? 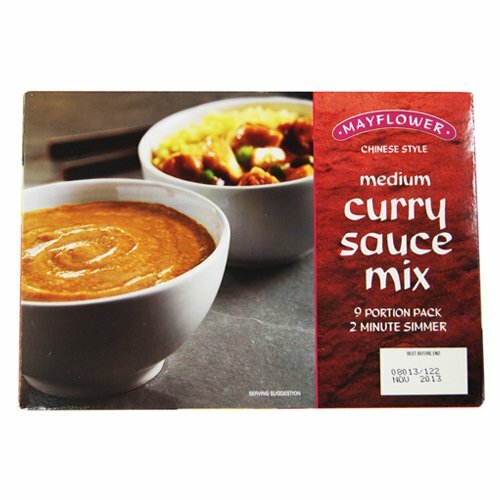 Mayflower Curry Sauce Mix comes in a 255g pack, which makes up 9 portions. This means that one portion is roughly 28.3 of the curry mix. The Mayflower Curry Sauce Mix is on the Slimming World app at 4 Syns per portion (28.3g). 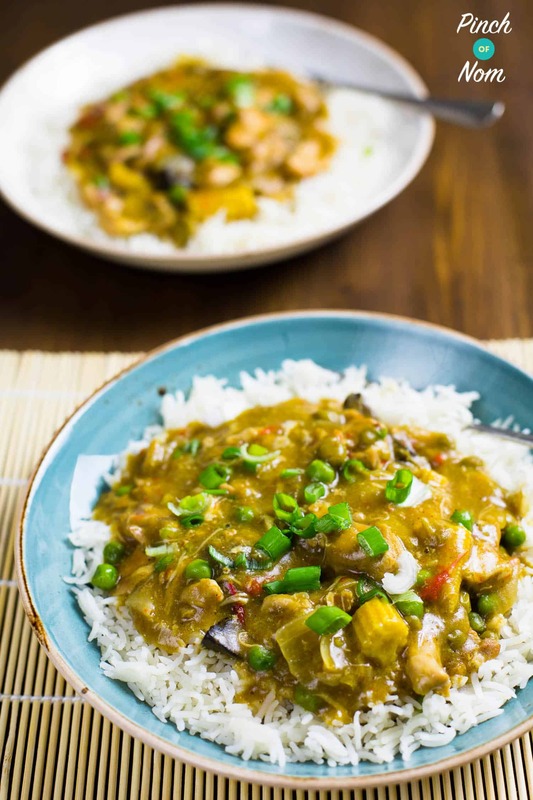 We have used 85g of Mayflower Curry Sauce Mix In this Chinese Chicken Curry recipe, which is equal to 3 portions (according to the pack instructions and the SW app). At 4 Syns per portion the whole recipe works out at 12 Syns. As there is plenty to bulk out this curry (the chicken and veg etc) there will be plenty to feed 4 people, which means that the Syns work out at 3 Syns per portion of Chinese Chicken Curry. 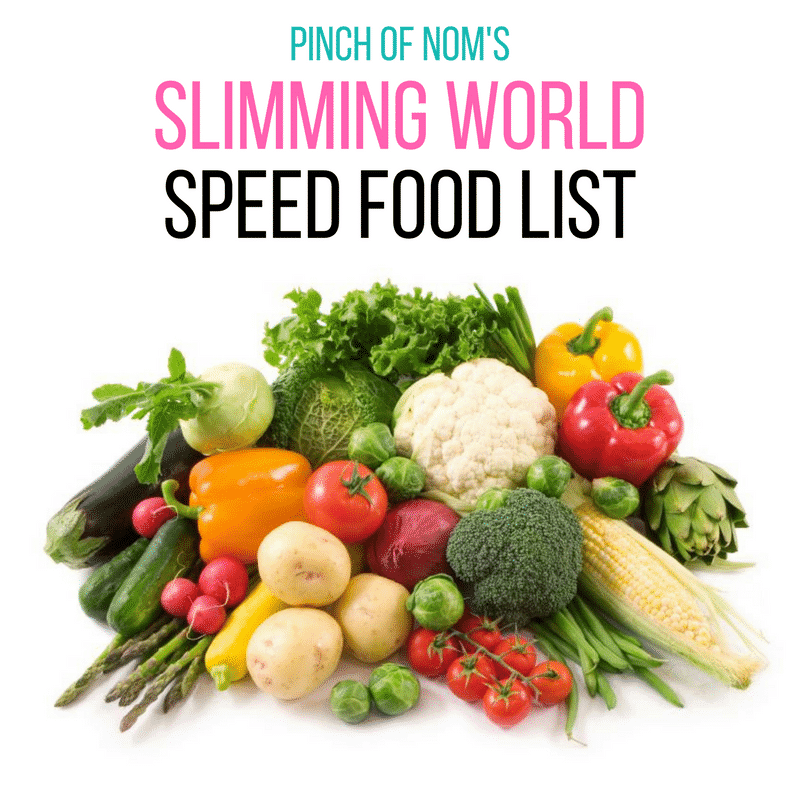 You can serve it with a whole heap of Speed Foods too – why not choose something from our Slimming World Speed Food List? 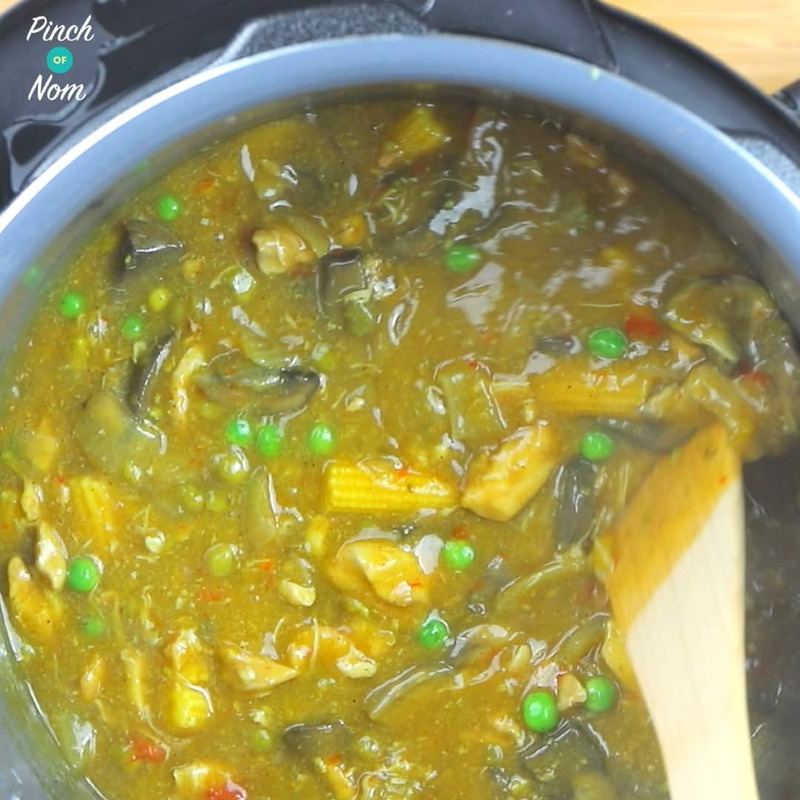 This Chinese Chicken Curry would be suitable for Slimming World Extra Easy SP if you leave out the peas. How Weight Watchers friendly is this Chinese Chicken Curry Recipe? A Chinese Curry from a takeaway restaurant could set you back a whopping 34 Points!! Eeeeek!! Our version has just 1 Smart Point per portion – 1!! That’s amaaaaazing!! 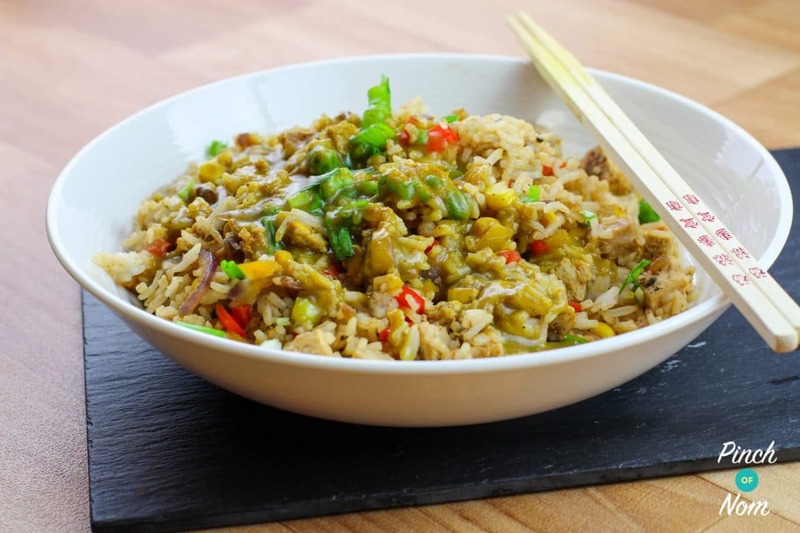 You’ll have plenty of Points left over for some accompaniments, like our Fakeaway Fried Rice! How many Calories are in this Chinese Chicken Curry? If you think Chinese Chicken Curry is going to be off the menu then think again! Our version has less than 300 Calories per portion! Just remember to add on the Calories of any accompaniment. What do I need to make this Chinese Chicken Curry? Not much really! Just the ingredients & a slow cooker. 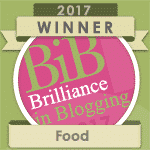 The curry sauce is by a brand called Mayflower, and it’s very, very popular amongst Slimming World members! They do a medium, or hot curry power mix and you can get it from Home Bargains, B&M or over on Amazon. 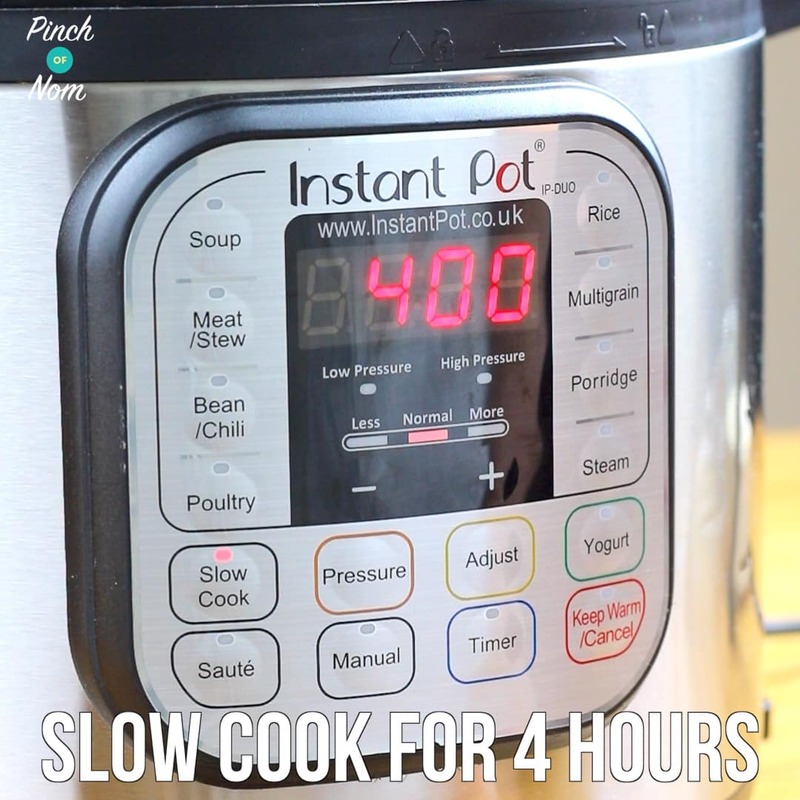 We use our Instant Pot as a slow cooker – it’s fab! Has a digital timer, keep warm function & is also a pressure cooker. It means we can cook a whole chicken in it in just 20 minutes 😱 Yes, really! 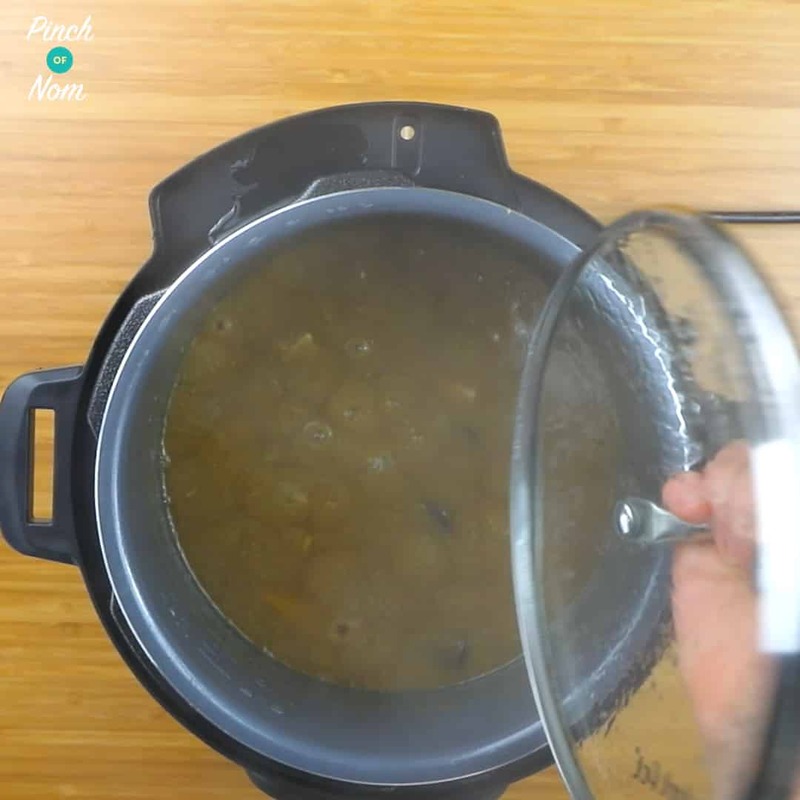 You can read all about the Instant Pot in our Instant Pot Review! How do I make this Chinese Chicken Curry? This Chinese Chicken Curry has to be one of the easiest dishes to prepare…. ever! The Full recipe is at the bottom of this page. First, mix the 85g of Mayflower Curry mix with the 340ml of water and set aside. Place the onions, peppers, baby corn, mushrooms, peas and diced chicken in the slow cooker. Crumble the stock cube over the top, then pour in the Mayflower Curry mix. Stir well, then set to slow cook on normal/medium for 4 hours. Add more more frozen peas if you like, and just let them heat through for a couple of minutes before serving. 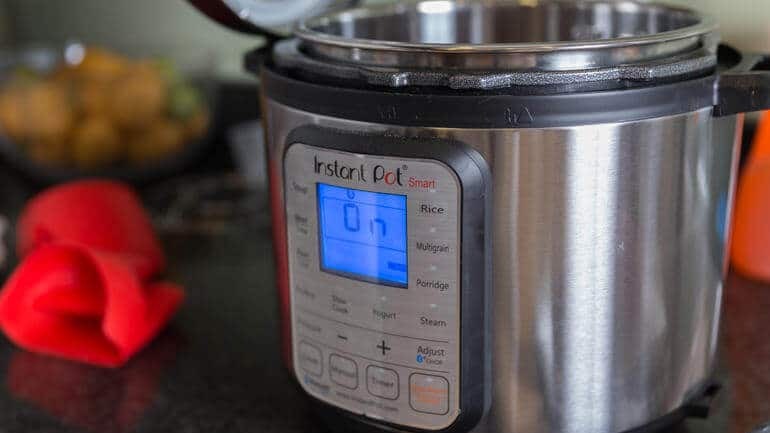 Hi Kate – temped to buy one of these instant pots are they really easy to use? Looks good. How long would this take in a pressure cooker please? We’ve not tried it in the pressure cooker, but it would probably take about 15 minutes. Hi,can any leftovers be frozen? Hi if I don’t use any meat would I still need to cook for 4 hours with just veggies? Hi, Is it cold water or hot water you are using to mix in the curry sauce mix?! You can mix the Mayflower curry powder with cold water, just make sure it’s blended well. Hi- this might sound silly but if you only use a third of the curry packet for the meal, what do you do with the other 2/3s? Can it be frozen? Or would you need to use it all up within a few days from the fridge? Or does it come portioned in the pack? The water is used to mix up the Mayflower sauce powder. Cold water should be fine, just stir until powder is fully combined. Hi. Is this suitable for freezing once cooked? Can you use any other curry sauce for this as I want to make it for tomorrow and won’t get the one used before then? Where do you get the mayflower curry powder from or what is. Mayflower curry is a powder that you make up with water. There are 9 portions in the box when made up as directed. You only use what you need, then you can seal the packet for next time. 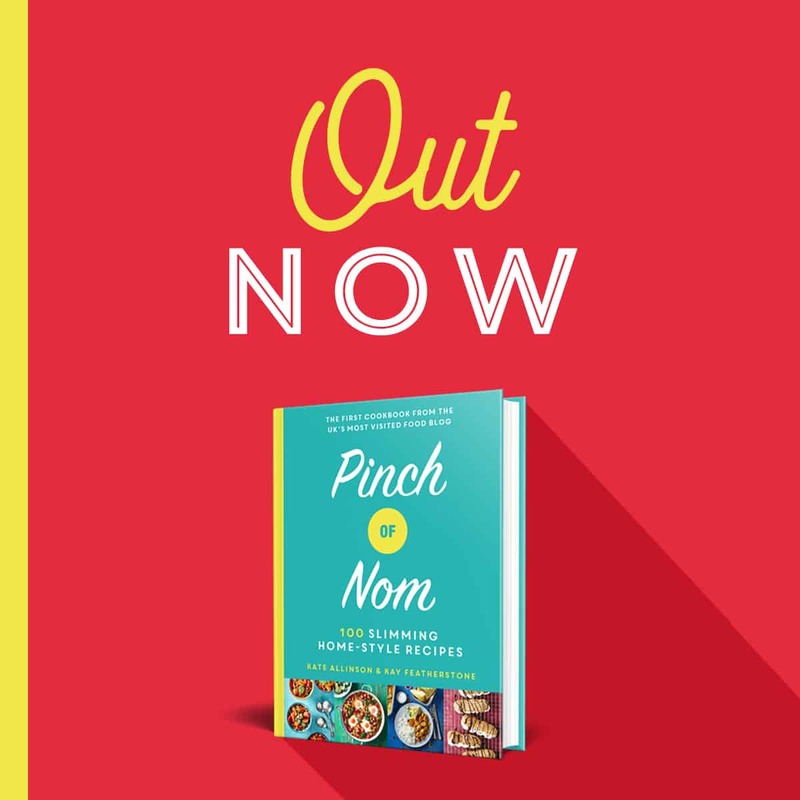 It’s available from B & M, Home Bargains and Heron Foods. Hi , I’m cooking this for 6 people. Do I double all your quantities? Scroll down to the recipe card at the bottom of the page, click in the ‘Servings’ box and choose the number of portions you want to make. The quantities of ingredients will automatically recalculate for you. Hope that helps! You should probably use the high setting, as this is the more commonly used setting for these types of recipes. You could follow the instructions for one of the curry sauce from the recipes link I’ve posted. Hope that helps! Oh no I have made it and had it on low (I only have high or low on my crockpot slow cooker) for nearly 3 hours? I don’t want to throw it away!!!!!!!! Help! Hi does this have to be made in a slow cooker ? Can i make it on the hob ? You can make this on the hob as well! Hi I’m just wondering you could do this on high in slow cooker? And also add a stock pot instead of a stock cube? I’ve been to Herons and got a 227grm frozen block of mayflower curry sauce. Do I still water that down ? Ooppssss used all of the powder without looking properly at instructions have a very curry sauce curry. Do you think I could freeze the remaining sauce that we don’t eat? Can you just use a normal curry powder like mild curry powder? Hi. I wondered if I could use raw king prawns in this recipe instead of chicken? Do you make curry sauce up before you put it in the slow cooker or do you just add 85g of the curry powder to the cold water mix and put in? Yes, you can do this in the oven in an ovenproof dish. It’ll take around 45 mins to an hour to cook. I’ve just made this for tomorrow’s diner but it looks nothing like the pic. It’s really runny and watery, looks more like a casserole. Any idea where I’ve gone wrong? The recipe uses 85g of Mayflower curry powder, made up with 340ml water. It will thicken as it cooks. If you followed these instructions and the curry seems a little runny remove the lid of the slow cooker and cook for another 30-40 minutes to reduce and thicken the sauce. Hi Jane thank you, sadly it didn’t thicken, it’s really really watery, don’t know if it’s came from the chicken or the lid, doesn’t look very apppetising but we will try it anyway. If I add cornflour will that help or ruin it do you think? Slow Cooker settings vary by model, but it should be fine for 3 hrs on high setting. You have this listen under your SP extra easy meal plan but you can’t have rice on an SP day it says? New to SP so what would you serve with this? The photos used are our stock photos for that particular recipe, which show a typical serving suggestion. Obviously, if you’re following SP, you would need to serve with a vegetable alternative, rather than rice, pasta or potatoes. You can add other speed veg, extra peppers, mange tout, sugar snap peas etc! Hi. I can’t seem to locate mayflower curry powder- is there an alternative? 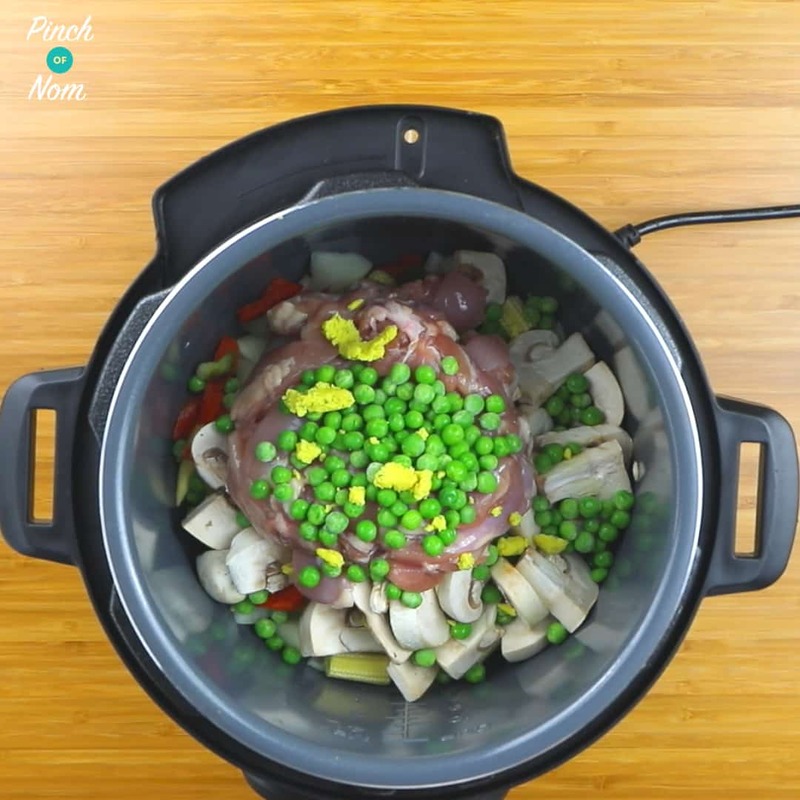 Use the high setting on your slow cooker and cook for around 3 hours. If the sauce isn’t thick enough, leave the lid off and continue to cook on high for another 30-40 mins. Hi can I use frozen peppers? Instead of fresh? 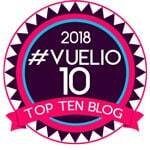 Hi , probably a daft question but could I use turkey in this ? Does 225g divided into 9 equal 25g?? Can I substitute the Chicken for Quorn Mince, the baby corn for Carrots and omit the Peppers? Would this work? Hi, if I’m cooking this in the overn, do I need to fry everything off first before it goes in or just put it all straight in the oven? It’s down to personal preference really. In this recipe, we don’t fry off before adding to slow cooker, so you don’t have to fry off for cooking in the oven. Thanks for getting in touch! Just wondering how long I should leave curry to cook on slow method in the slow cooker? Just made this and I’m VERY impressed!. So easy to make but the flavour and simplicity makes this a life-long easy & tasty dish to make! I have enough to last me for days so I am delighted. I will make this quite often now as it’s so easy and so damn tasty. Having discovered SC liners too is an absolute Godsend. It’s my first time using Mayflower sauce but in future I’m going to use nothing else! I have to say, you have the patience of a saint! I wish people would read before asking questions which are already answered above! How can no do this recipe for the oven instead of a slow cooker? To make for parents for 6 people rather than 3 so want to check my ingredients. You certainly can use chicken thighs instead! Also, if you alter the number of servings on the recipe card, the ingredients will adjust for you automatically.